Rock drum is the first and current editor-in-chief of This Month in GLAM. He presented on the newsletter at the December 2011 GLAMcamp Amsterdam. The slides of that presentation can be seen here. In this article he talks about the experience of seeing both the GLAM movement and the newsletter develop over 2011. The inaugural edition of This Month in GLAM, published in January 2011. Liam first contacted me about a newsletter for the GLAM project towards the end of January last year. We envisioned that it would "look rather like the technology report in the Signpost", which the first edition did: there were a few bullet points and a photo (see right). Since then there have been 11 issues, delivered to an ever-growing number of people. As the editor of the newsletter, I have had a unique opportunity to watch the GLAM movement develop as a whole. This time last year, there were just a handful of GLAM events - and most of those were to mark Wikipedia's tenth anniversary. In February, the Château de Versailles in France became the latest institution to play host to a Wikipedian in Residence and Derby Museum and Art Gallery in England piloted the use of QR codes linking to Wikipedia articles (a predecessor to QRpedia) in their galleries. In March, the idea of a "GLAM Ambassador" beginning to take shape, and the GLAM Steering Committee was formed, though both ideas were later modified. In an exciting month for GLAM, April saw the Smithsonian Institution's Archives of American Art and US National Archives bring onboard a Wikipedian in Residence. The GLAM panel at Wikimania 2011 – one of many GLAM-related sessions held there. The next month, GLAMcamp NYC – an "in-reach" conference where participants improved case studies on GLAM projects and other materials – was held in the New York Public Library. The National Archives also donated 220 high-resolution black and white photographs taken by Ansel Adams. In June, WMF GLAM Fellow Liam Wyatt (Wittylama) visited growing GLAM communities in Belarus and the United Kingdom. In July, articles in the newsletter began to be split up by country. We had news from the UK, France, Germany and Spain. The residency at the Château de Versailles came to a close, Wikinews reporter Brian McNeil (Brian McNeil) was invited on a press tour of the re-opening of the National Museum of Scotland and Wikimedians from all around the world ran a "wikilounge" at the Communicating the Museum conference in Düsseldorf. Contributing to the sticky note wall at GLAMcamp Amsterdam. August was dominated by Wikimania. The annual conference, this year held in Haifa, Israel, hosted 720 participants from 56 countries and was attended by GLAM project participants from around the world, coming together to share their projects and ideas. The conference featured three days full of presentations, based around multiple tracks, one of which was "Wiki Culture and the Community," which allowed for the development of two "GLAMorous" sessions and other sessions involving GLAM related projects. Various other events took place as well, as part of the conference and after hours. In September, Laura Hale (LauraHale) became the Wikipedian in Residence for the Australian Paralympic Committee, where she co-ordinates projects including having paralympians read the article about themselves, as part of the Spoken Wikipedia project. Wikimedia meetup in Taghreedat, as part of Liam Wyatt's visit to Qatar. October was a great month with GLAM really starting to take off in several institutions in Israel and GLAM programs Serbia given a kick start. November saw more exciting developments elsewhere. In the final months before his fellowship ended in December, Liam Wyatt visited Wikimedian communities in the Arabian Gulf and East Asia. He paid a visit to Al Jazeera who agreed to release all of the images on their Flickr stream under a Creative Commons license. These have been imported to Commons and can be found here. The year, for GLAM, ended in Amsterdam. Around 60 Wikimedians from all around the globe gathered in the Dutch city for the second ever GLAMcamp at the beginning of December. I’m excited to see how the newsletter and the movement as a whole will continue to develop over the coming months. There are already several big GLAM events (and plenty of small ones) planned for 2012 and I look forward to seeing where the GLAM project will be this time next year. MonmouthpediA cupcake with QRpedia code, from an event in Monmouth. User:Mrjohncummings is John Cummings, the project lead for MonmouthpediA, a project in the Welsh town of Monmouth which aims to provide access to information on notable places, peoples, artefacts and more around the town. MonmouthpediA is the first Wikipedia project to cover a whole town. The project aims to cover every single notable place, person, artefact, flora, fauna and other things in Monmouth in as many languages as possible. QRpedia codes will be used, a type of bar code a smartphone can read through its camera that takes you to a Wikipedia article in your language. QR codes are extremely useful, as physical signs have no way of displaying the same amount of information and in a potentially huge number of languages. The aim is to have 1,000 QRpedia codes in Monmouth by April including in several museums. A free WiFi network will be set up throughout the town and tablet PCs will be available in the museums to lower the cost of access to the information. Since the project started we have had fifty new articles in English, about twenty in Welsh and a small number in other languages. This is especially remarkable as we had no active Wikipedians in Monmouth when the project launched. John Cummings had to move from Bristol back to his home town to lead the initiative. The project is achieving a lot because Wikimedia UK has gone into partnership with Monmouthshire County Council and nearly every significant cultural society in Monmouth. Besides the Town Council the project also has significant links to university research in both Newport and Cardiff. New articles about Monmouth have been on "Did you Know?" a dozen times in the last few weeks. Not surprisingly the project has attracted news coverage from the BBC and The Guardian newspaper as well as being reported in several different languages. One blog asked "Is Monmouthpedia the future of Wikipedia?" - we will find out in April, when the celebrations of what we have achieved begin. Well, we say "we have achieved" but hopefully it is what "you have achieved". Monmouth cannot do this without your help. Some of the images that have been uploaded since the project began. The first code of many! So far contributors have created 72 new articles and improved 90 articles, over 300 new images, there have been 12 entries in the "Did you Know?" on the English Wikipedia main page. New contributors to Wikipedia (as a result of the project) are choosing to learn how to edit Wikipedia and to give their time for the combined knowledge of others, I think this demonstrates how much people value free information and it’s benefits. It’s been amazing to teach people simple tools to give a wider reach to the information they have. I started Monmouthpedia because I wanted everyone to have free and easily available information about the place in which they live. I grew up in Monmouth, I knew enough about the area to make a start by myself and make a plan that other people could see what I was doing and join in and add to and change. Local groups and the councils (Monmouthshire County Council have recently adopted the Open Government License) have been wonderfully supportive and there is a well connected network of people who are willing to help. Wikimedia UK have been very helpful and have put a lot of time and effort into supporting me. I feel as though for the large part I have been pushing against open doors, I’ve had a steady stream of new people to teach Wikipedia editing to since I started. The one thing we're really missing are articles in languages other than English and Welsh. The project is still very much a work in progress, we are starting to work with schools and other groups, there is such a wide range of opportunities for so many groups of people to be involved, it feels like we’re trying something new every day. For information on participating and more information see: w:en:Wikipedia:GLAM/MonmouthpediA. Content donation in Coventry: This month the Herbert Art Gallery and Museum in Coventry began a content donation of watercolours depicting Coventry and the surrounding villages as part of the ongoing partnership. For more information on the donation see the project page. QRpedia shortlisted for a Smart UK award: Terence Eden and Roger Bamkin (Victuallers) had the opportunity to visit the Westminster conference centre to talk with the press and the judges of the Smart UK awards. QRpedia had been chosen from a high number of entrants to be in the final twenty shortlisted to represent the UK as ther best innovative mobile based idea. Competition was stiff with other entrants including being a coating which when applied to a phone allows it to be used in water and and another which enableded phones to see hand gestures. Only four will be chosen to go forward to the global competition, but it is an honour to be considered. For more information see Smart UK's QRpedia Q&A. The "GLAM team" began to prepare a draft of a "GLAM toolbox" which will provide a dedicated interface for cultural institutions with specific tools, documentation in French and a collaborative workspace. The project is currently in development and will be voted upon by the Board of Wikimedia France in February. We will define the project with the goal of internationalization. On January 21, nine Wikimedians conducted a workshop at the Library of Toulouse. They taught the public how to contribute to Wikipedia and the librarians how to conduct a workshop. Other workshops are planned for the rest of the year. The theme of the contributions will be "the districts of Toulouse", in line with the theme of the Library in 2012. It is expected that these workshops will be done only by the librarians of Toulouse, without the involvement of any Wikipedians. Celebrating Public Domain Day in France! On January 26 Wikimedia France organized "Public Domain Day" with Creative Commons France, Communia and people from the Open Knowledge Foundation (OKF). The event brought together representatives from those organizations to meet with attendees, lawyers and advocates for free culture and digital freedom. The objective was to teach the public about the Public Domain, to show the richness of the Public Domain, but also threats to it and the complicated legislation (a demonstration of the OKF calculator was very effective). The event, which brought together around 50 participants, was the first time that an event related to the Public Domain Day was held in France. It is hoped that this will be replicated next year. The website dedicated to the Public Domain remains online and can be found here (in French). Wikimedia Germany is organizing the Wikipedia Academy 2012, and the Call for Papers was released this month, inviting contributions under a set of themes around Wikipedia and free knowledge, many of which match with GLAM activities. The Long nights of museums and Long nights of the sciences are a series of events that enjoy a growing popularity in Germany, as they bring together GLAM institutions and the public. The first informal GLAM:Wiki partnerships are beginning to take shape within this framework, and interested Wikimedians are welcome to join in. Die Lange Nacht der Museen und ihre Schwester, die Lange Nacht der Wissenschaften, haben sich in vielen Städten zu einem beliebten kulturellen Großereignis entwickelt, im Rahmen dessen sich GLAM-Institutionen breiten Teilen der Bevölkerung vorstellen. Wikimedianer haben Lange Nächte wiederholt dokumentiert sowie bei solchen und ähnlichen Veranstaltungen auch eigene Stände organisiert. Vor dem Hintergrund vorhandener GLAM:Wiki-Partnerschaften in anderen Ländern bietet es sich an, einmal das Potential der Langen Nächte für ähnliche Kooperationen hierzulande auszuloten. Das Museum für Naturkunde Berlin sowie die Universitätsbibliothek Leipzig haben bereits Interesse daran signalisiert, und erste gemeinsame Aktivitäten sind für die jeweiligen Langen Nächte der Wissenschaften – am 2. Juni in Berlin und am 29. Juni in Leipzig – vorgesehen. Die Details sind noch zu klären, und wer sich daran beteiligen oder Kontakt zu weiteren potentiellen GLAM-Partnern herstellen möchte, ist herzlich dazu eingeladen. Dabei geht es zunächst darum, welche Informationen oder Demonstrationen wir Besuchern der Einrichtungen in der Nacht anbieten können, welche Ausstattung wir dafür benötigen und wer vor Ort sein kann. Die GLAM-Kooperation mit dem Museum für Hamburgische Geschichte besteht seit Dezember 2010. Der Erste QR-Code im Museum für Hamburgische Geschichte. Der Vollglasüberdachte Innenhof des Museums für Hamburgische Geschichte. Demnächst mit QR-Code? Die Fundació Miró macht's vor: Infotafeln mit integrierten QR-Codes. Nach dem Interview mit Spiegel Online vom Oktober 2011 wurde das Interesse des Museums für Hamburgische Geschichte am Thema QR-Codes erneut geweckt. Die Erfahrungen aus dem Children's Museum in Indianapolis, der Fundació Miró und dem Derby Museum haben gezeigt, was die eckigen Codes von QRpedia für Institutionen leisten können. So erzielte das Children’s Museum in Indianapolis mit nur 4 installierten Codes 3350 Aufrufe (Juni bis Dezember 2011). Für die Stakeholder und Entscheidungsträger in GLAM-Institutionen sind Zahlen, die Erfolg oder Misserfolg von Kooperationen darstellen zentral für die Entscheidungsfindung. Auch für den Aufbau von Austellungsflächen oder die Konzeption von Räumlichkeiten ergeben sich dadurch neue Ansätze. Getreu dem Motto „Was interessant ist, wird gescannt“, kann eine GLAM-Institution einschätzen, welche Bereiche für die Besucher besonders interessant sind und stark frequentiert werden. Für das Museum für Hamburgische Geschichte, das seit Dezember 2010 Teil einer GLAM-Kooperation ist, bietet sich in QR-Codes die Möglichkeit, die Vermittlung Freien Wissens auf eine neuartige Weise zu unterstützen und einen Vorstoß in Richtung neue Medien zu wagen. Am 08. Dezember 2011 konnte User:pigsonthewing zusammen mit User:Peter Weis im Museum für Hamburgische Geschichte vorsprechen, um Inhalte rund um das Thema QRpedia zu präsentieren und Möglichkeiten für die Einbindung in das hauseigene Konzept aufzuzeigen. Dank der tatkräftigen Unterstützung durch Johannes Rohr (WMDE) war es möglich, das User:pigsonthewing so kurzfristig nach dem GLAMcamp in Amsterdam am Treffen in Hamburg teilnehmen konnte. QR-Codes sind in der bisherigen Anwendung immer zusätzlich zu bestehenden Maßnahmen genutzt worden. Neben Audioguides, Infotafeln und Broschüren soll es auch Museen geben, die ihren Besuchern Tablet-Computer für die Dauer des Besuches an die Hand geben, um die Ausstellung zu Erkunden. QR-Codes dienen also bisher zur Unterstützung bestehender Systeme. Anhand der Praxisbeispiele aus anderen Ländern ließ sich gut einschätzen, welche Schwächen und Stärken das System aufweist. Bei geringen Lichtverhältnissen, mangelndem Empfang oder gar einem abgenutzten QR-Code funktioniert das System nicht. Auch Artikel zu den teils sehr speziellen Themen der Institutionen müssen erst geschrieben werden. Die Edit-A-Thons aus anderen Häusern weisen auch hier den Weg. Zusammen mit der lokalen Wikipedia-Gemeinde wird meist in der Institution an Artikeln gearbeitet, die dann von der globalen Gemeinde in eine Vielzahl von Sprachen übersetzt werden können. Vor allem die technische Umsetzung war für die Anwesenden von Interesse. QR-Codes können prinzipiell mit jedem Drucker erstellt werden und auf vorhandene Infotafeln aufgeklebt oder neben Objekte in Schaukästen gepinnt werden. Um die Haltbarkeit der Codes zu erhöhen, kann man entweder zum Laminiergerät greifen oder direkt Infotafeln erstellen, die mit den schwarzen Quadraten bestückt sind – am Ende vor allem eine Frage des Geldbeutels und des Cooperate Designs. Am Ende des Treffens konnten viele Fragen beantwortet werden, aber mindestens genauso viele Fragen ergaben sich durch die neuen Eindrücke. Die Winterpause wurden auf beiden Seiten genutzt, um eine Evaluierung durchzuführen und sich im neuen Jahr zu einem zweiten Treffen zusammenzufinden. Am 27. Januar fand nach dem Jahreswechsel ein zweites Treffen statt, um QR-Codes im Museum für Hamburgische Geschichte zu realiseren. Gemeinsam mit Martina Fritz und User:Peter Weis wurden potentielle Objekte des Museums erkundet und die zuvor ermittelten Probleme in der Praxis getestet. Dicke Mauern sind hinderlich für den Internetmpfang des mobilen Endgerätes – Ausstellungsflächen im Keller oder im Zentrum des Gebäudes schieden also aus. In den Blick gerieten vor allem die Objekte, die bisher nicht durch die eigentliche Ausstellung erfasst sind: Türen, Torbögen und andere architektonische, teils fest im Haus eingebaute Elemente sollten in Zukunft via QR-Code zugänglich sein. Diese Objekte haben in der Regel keine eigenen Infotafeln und bleiben dem Besucher so verschlossen. Mit Hilfe von neuen Infotafeln, die bereits QR-Codes enthalten, wäre es möglich, beide Systeme zu verknüpfen. Die menschenlesbare, aber nur in wenigen Sprachen verfügbare Beschreibung und der maschinenlesbare QR-Code ermöglichen auch Besuchern ohne Gerät oder bei technischen Schwierigkeiten einen Zugriff auf die Information. Im nächsten Schritt soll geprüft werden, was sich einerseits technisch, andererseits finanziell realisieren lässt. Two case studies have been created to document the pilot collaborations between GLAMs and Wikipedia in Italy: the collaboration with the National Technological and Archeological Park of the Colline Metallifere Grossetane in Tuscany Region and the collaboration with the International Centre for Architectural Studies Andrea Palladio based in Vicenza. Between the end of 2006 and the beginning of 2007 within the project Parco-tag, the staff of the National Technological and Archeological Park of the Colline Metallifere Grossetane has created QR codes from Semapadia to identify mineralogical sites and to link them to Wikipedia articles created to document the territory. The initiative was officially presented in collaboration with Wikimedia Italy in November 2007 during the Expò of Cultural Heritage in Venice. In September 2007, the International Centre for Architectural Studies Andrea Palladio has provided high quality texts and images about the entire work of the architect Andrea Palladio which has been used to create articles on Wikipedia in Italian and English. The collection of art from Africa, Asia and Latin America owned by Milan city council at the Castello Sforzesco will be uploaded on Wikimedia Commons. The Raccolte Extraeuropee del Castello Sforzesco has just enthusiastically signed a letter in which they express their support to WikiAfrica and they agree to provide 4.000 images and description of their works in CC BY-SA. The collection is not open to the public because it is still waiting for its museum; Wikipedia and the Wikimedia Projects represent a very important step to make the collection available for the first time to the public. This is also the first public GLAM in Italy contributing to Wikipedia. Fondazione Passarè has also expressed its support to the project WikiAfrica. Fondazione Passarè is the foundation which preserves and valorize the works and archives of Alessandro Passarè (1927-2006), an Italian collector of African art who carefully documented his travels to Africa. 300 work of the Passarè foundation are part of the Raccolte Extraeuropee del Castello Sforzesco and they are currently and partially in view in an exhibition at Castello Sforzesco. Press conference to present new cultural institutions involved in Share Your Knowledge and WikiAfrica, expected date March/April 2012. Mexico’s second museum to donate images to Wikipedia is the Museo del Objeto del Objeto. This oddly-named institution, which translates to "Object (purpose) of the Object Museum", was founded in 2010 in Mexico City by Bruno Newman of the Zimat Communications company. The museum’s permanent collection consists of Newman’s personal collection of advertising, packaging and gadgets, dating from 1810 to the present, gathered over 40 + years of his life. The purpose of the museum is to promote scholarship of commercial design and communication with the collection as a base. The first donation of images is of 22 objects from the permanent collection and includes items such as packages for cigarettes, soap, mucilage (who is old enough remember what that is?) and more. While processing the donation, I found the images extremely useful as many articles either lacked images or lacked image with a historical perspective. However, I also found them difficult to categorize. The full donation can be seen at Images from the Museo del Objeto del Objeto. Pieter Teyler van der Hulst died in 1778 and, in his will, he specified that his collection and capital had to be used for the promotion of art and science. For this purpose, a foundation was set up with five directors who had to manage the money for the specified purpose, including the gathering of knowledge. At that time, most knowledge was reserved for universities and the clergy only. In Haarlem however, there was no university and the clergy only had limited power. Haarlem was therefore the ideal location to inform the people about science and art. In the following centuries, Teyler's Museum bought thousands of pieces in the fields of fossils, minerals, paintings, drawings, coins/medals, and instruments to show scientific discoveries, but books were the best sources of knowledge. In that age, books were real pieces of art where art and the sciences were brought together, to make showing and describing the discoveries possible. The first purchase with Pieter Teyler's money was the purchase of an encyclopaedia. Wikipedia and the Teyler's Museum both have the same goal: to collect knowledge and make this knowledge available for the public. With this background, a partnership between both institutes has been organized to use the benefits of each. To kick-off of this partnership, Wikimedia Nederland and the Teyler's Museum organized on 21 January a tour with a view behind the scenes of the oldest museum in the Netherlands. After a plenary presentation by Marjan Scharloo (the director of the Teyler's Museum) and Ziko van Dijk (president of Wikimedia Nederland), the writing contest The Teylers Challenge was announced. Then the audience was divided into seven groups, each led through the different parts of the museum, with a guide explaining the pieces held in those sections. Afterwards, a New Year reception was held by the chapter at the Grote Markt. With this presentation and tour, The Teylers Challenge was presented: an international writing contest on Wikipedia about subjects that are linked to the Teyler's Museum. The articles may be written in any language, about a wide spectrum of subjects, and there is only one condition to participate: on the article there must be a blue link to the article of the Teyler's Museum in that language. This means that if the museum article doesn't yet exist in that language, it must be created (and that article can be part of the contest as well). The Teyler's Museum offers us images and information on the relevant topics. Information about some of the topics can be found on their website ( Teyler's Museum | Teylers Universe ). The museum will also respond to requests for information or images to be obtained for articles on Wikipedia. These requests can be put on w:en:Wikipedia:GLAM/Teylers/One on one collaborations (in English or Dutch). The writing contest runs until May 2012 and there are prizes to be won, made available by the Teyler's Museum. The ideals of Pieter Teyler in the 18th century match with the ideals of Wikipedia today. Let's take up the challenge and enrich Wikipedia on the fields of art and science, and share this information with the world. For participation and more information see: w:en:Wikipedia:GLAM/Teylers/Multilingual Challenge. Read this report in English or Russian. In January it was opened exhibition in Russian "Вики любит Ар-нуво", the first exhibition of Europeana in Russian. The exhibition "Wiki Loves Art Nouveau" was opened in December on the results of user voting by jury's Wiki Loves Monuments'2011 shortlist (WLM is competition dedicated to photographing monuments in different countries). It is planned to continue cooperation within the framework of which other virtual exhibitions will be translated into Russian too, and, in addition, Europeana is looking for volunteers who will make virtual exhibitions available in other languages​​. В январе открылась на русском языке выставка «Вики любит Ар-нуво», первая выставка Europeana на русском языке. Сама выставка Wiki Loves Art Nou­veau открылась в декабре по результатам пользовательского голосования из шорт-листа жюри конкурса Wiki Loves Monuments'2011 (конкурса, посвящённого фотографированию памятников архитектуры различных стран). Планируется продолжение сотрудничества, в рамках которого будут переведены на русский язык и прочие виртуальные выставки; кроме того, Europeana ищет добровольцев, которые сделают виртуальные выставки доступными и на других языках. The Australian Paralympic Committee and Wikimedia Australia are continuing HOPAU: Wikimedians to the Games. This project was highlighted on the front page of the Australian Paralympic website and was mentioned in Wikipedia signpost. With the help of the Wikimedian in Residence, 14 spoken word articles about the Paralympic Games and Australia at the Paralympics were contributed to Simple English Wikipedia. These 14 articles represent a large proportion of all Spoken Word articles on Simple Wikipedia, with only 36 other articles having Spoken Word versions on them previously. Another 14 Spoken Word articles were created on English Wikipedia. Views to the Australian Paralympic Committee related content were down by half from period between 1 December 2011 to 30 December 2011 from the period between 26 October 2011 to November 24 2011, with 55,900 article views compared to 76,000 views. This was attributed to several factors, including the holiday season and the lack of a large number of DYKs helping to drive views to articles. The most popular article in December was Jeremy Doyle, while in the November period it was Troy Sachs. Several HOPAU participants did a mini edit-a-thon on 2 January 2011, and worked to improve the article about Brian McNicholl, a Paralympian who competed in at least six Paralympic Games and, between the Paralympics and Stoke Mandeville Games, won six medals. This was followed up by additional research and source work at the National Sport Information Centre where sources were found to help improve articles about Victorian Paralympians active during the late 1980s, 1990s and 2000s. There has been a major push by Graham87 to add information about Australian Paralympians who have been awarded the Medal of the Order of Australia and other honorary medals. He has updated over 50 articles about individual Paralympians with this information. In addition, there have been several discussions on the hopau mailing list where Paralympians have shared their knowledge and related their experiences about getting these honours for Paralympic medal winners. As part of an ongoing effort to better organise GLAM materials related to the HOPAU project on English Wikipedia, a WikiProject box was created for inclusion on talk pages. It has been added to many articles that are covered by the project including Peter Homann, Priya Cooper, Australia men's national goalball team and Australia at the Paralympics. This has several benefits, including make it easier to find articles, to get better project statistics, and more easily point potential contributors to an assessment area to highlight our best content. Graham87 has been very active in January and expanded a number of articles about Paralympians including Russell Short, Deahnne McIntyre, Tracey Cross, Julie Russell, Peter Homann, :Christopher Scott, Melissa Carlton, Anton Flavel, Kieran Modra, Lyn Lepore,Lisa McIntosh, Kerry Golding, Tania Modra, Sarnya Parker, Greg Ball, Eric Russell, Julie Higgins, Noel Robins and Jamie Dunross. Many of Australia's Paralympic competitors had scholarships at the Australian Institute of Sport. Aussiesportlibrarian has gone through many articles about Australia's Paralympic and non-Paralympic competitors to note which ones. RecentChangesCamp is an Open Space facilitated general wiki conference that has been around since 2006, when it was first held in Portland, Oregon. It has been held yearly ever since in the United States, Canada and Australia, and attracts participants from all over the wiki community including commercial wikis like wikiHow and Wikia staff and community members, non-profit related wiki participants, wiki developers on multiple wiki platforms, open culture enthusiasts, educators using wikis, and people in the GLAM and cultural sector. It is not a GLAM conference, but GLAM participants have always attended, participated with, interacted with and shared their knowledge with the wider wiki community. Several people from the Australian and international GLAM movement attended RecentChangesCamp 2012 held in Canberra from 20 to 22 January. They included LauraHale, John Vandenberg, Danny_B., Whiteghost.ink, JJ Harrison, Wittylama, Chris Woodrich, and others. While the conference was Australia's general wiki conference and not specifically focused on GLAM, there were several sessions that specifically discussed Australian GLAM efforts including the Australian Paralympic Committee's GLAM project, the National Library of Australia, efforts underway at the National Museum of Australia and Wikimedia Indonesia's LONTAR project. Most of the international participants at RecentChangesCamp 2012 were involved with GLAM projects and visiting Australia for the first time. They were pleased that the conference was being held in Canberra because members of our local GLAM community were in attendance, and because they had a chance to see wild kangaroos out the window of the event venue. Two took the opportunity to go outside, enjoy the beautiful summer weather and take pictures of the 'roos with the intention of uploading these pictures to Commons. Chris Woodrich, a Wikipedian who does freelance work for Wikimedia Indonesia, visited Canberra to attended RecentChangesCamp with scholarship assistance from Wikimedia Indonesia and Wikimedia Australia. He has been active in Wikimedia Indonesia's GLAM efforts with libraries and education. He talked about the needs of the Indonesian Wikimedia community, issues involving creating Indonesian content on the English and Indonesian Wikipedias, and problems regarding the lack of Indonesia-related pictures on Commons. While attending, he made contact with several Australian and international attendees that will help him with future GLAM efforts in Indonesia, and learned about a conference facilitation that might be useful for him on the ground in Indonesia. The Indonesian report on RecentChangesCamp can be found on their wiki and was mentioned on their Facebook account. Danny B. from the Czech Republic attended RecentChangesCamp in Australia. RecentChangesCamp is a general wiki conference which uses open-space that attracts people from the wider wiki editing community including commercial wikis, non-profit wikis, wikis used in education, personal wikis, wiki programmers and Wikimedia project wiki contributors. His participation was possible because of grant assistance from Wikimedia Australia. His route from the Czech Republic to Canberra and back took over 70 hours each way, include overnight stays in Seoul, South Korea and Sydney, Australia, and ended with a 3 and a half hour bus ride from Sydney to Canberra. His participation at RecentChangesCamp came about because of connections he made at GLAMcamp Amsterdam in December 2011, where he met LauraHale from Australia and had an extended discussion about wiki metrics. While attending sessions various topic sessions, such as those on technical topics, communication and outreach or cultural outreach session, he interacted with a number of Australian wiki users including those from the education sector, non-profit sector, and government sector, sharing some of his experiences from Czech projects. He was also transferring his experiences at the session focused on starting of New Zealand and Thai chapters. Danny B. z Česká republika se zúčastnila RecentChangesCamp v Austrálii. RecentChangesCamp je obecná wiki konference, která se používá open-space, který přitahuje lidi z širšího Wiki úpravy Společenství, včetně obchodních wiki, neziskové wiki wiki ve vzdělávání, osobní wiki wiki programátorů a projektů Wikimedia wiki přispěvatelů. Jeho účast byla možná díky grantové pomoci z Wikimedia Austrálie. Jeho cesta z Česká republika do Canberra a zpět trvalo více než 70 hodinách cesty, včetně přenocování v Soulu, Jižní Korea a Sydney, Austrálie, a skončil s 3 a půl hodiny jízdy autobusem ze Sydney do Canberra. Jeho účast na RecentChangesCamp přišla, protože on dělal spojení na GLAMcamp Amsterdamu v prosinci 2011, kde se setkal s LauraHale z Austrálie a měl delší diskusi o metriky wiki. Zatímco navštěvuje různá setkání téma setkání, jako jsou ty, o technických tématech, komunikace a informačních a kulturní dosah zasedání se ve styku s řadou australských wiki uživatelů, včetně těch z oblasti vzdělávání, neziskového sektoru a sektoru vládních institucí, sdílení některých své zážitky z českých projektů. On byl také převést své zkušenosti na seminář se zaměřil na zahájení Nového Zélandu a thajské kapitol. help knowledge about such projects be transferred effectively among projects. John Vandenberg, Whiteghost.ink, JJ Harrison, Chris Woodrich were participants in a session that tried to develop a model for projects that took place in the present, and had an end point, and were therefore different from projects involving ongoing work in organisations (whether GLAMs or other sorts of organisations). The model developed was called "NEXT", (News, Events, eXhibitions, Travel). Wikimedia Australia is providing grant money to fund professional journalist accreditation cards for accredited reporters in Australia, New Zealand, Oceania and other regions not being supported by established chapters. This sort of support is appropriate to NEXT activities and different from the kind that assists by sharing practices suitable for GLAM outreach such as Wikipedians-in-Residence. The model in detail and its application is explained on the OutreachWiki page NEXT. Another session was about Wikipedia efforts by the National Museum of Australia, with a museum staff member facilitating the session. Much of the session revolved around discussing copyright issues surrounding museum collections, and the desire for museums to make more of their collection available to the public by being able to photograph it both institutionally and by the public at large. The museum could not do this, not because of commercial concerns, but because of copyright and trademark issues. For example, Australian-made Holden cars often have the Holden logo, a trademark, on them. It is not easy to take pictures of these cars with the trademark removed without losing the idea of the photograph's subject. In other examples, some items in a collection do not belong to the museum exhibiting them. The copyright belongs to the original owners or the donations come with copyright related restrictions that prohibit the museum from taking pictures or allowing others to take pictures of them. Because copyright and trademark issues vary from item to item in a collection, museums may prohibit visitors generally from taking pictures of the whole collection. Copyright issues are so complex that there are two or three lawyers employed by the National Museum of Australia who spend a great deal of their time working on them. Amongst GLAM participants, a recurring theme was metrics, how to measure the effectiveness of GLAM projects on Wikimedia Foundation projects, and how these metrics can be used to justify institutional participation in a project. There are a variety of methods that have been designed by German Wikipedians and ones designed by members of Wikimedia Australia like John Vandenberg. The problem is that at the end of the day, most GLAM organisations including the National Library of Australia and the Australian Paralympic Committee have a mission that includes sharing cultural knowledge of their efforts with, in this context, Australian society. This is not something that can easily be measured because it is more a goal than an objective. There was a discussion regarding issues of getting sport-related organisations to donate pictures to Commons, the challenges of working with such organisations, and how to engage Wikimedia Australia members to increase pictures, video and sound at sporting events in a context outside official relationships with a team, league or sport. Ideas included working with our current members to get them organised with journalism credentials on Wikinews, proving the success of programs like Wikimedians to the Games, and personal outreach. There was also a discussion about freedom of panorama in Australia and how this extends to cover live sporting events both inside and outside. Users Bidgee and JJ Harrison, took over 1,000 pictures at the basketball game. For both photographers, this was a unique experience as they rarely photograph sport, which requires a different understanding of framing of pictures. There is a hope to get at least one featured picture from this session and there will be more Australian sport pictures. On Sunday, a few campers had to leave the Camp early and several people ended up visiting various cultural institutions around Australia's capital. JJ Harrison was part of one such group who ended up visiting the Parliament House. He took several pictures while the group toured the building. One important picture he took was of the Australian copy of the Magna Carta. Selected files can be found on his gallery page. The group also visited the National Library of Australia and the National Museum of Australia. Chris Woodrich facilitated a session on the LONTAR Project. This is a project that has enjoyed support from Wikimedia Australia because of membership involvement. There was a discussion about the National Library of Australia, and a slow down in digitisation efforts on TROVE, an important Australian resource that provides easy citations for Wikipedians. There were a few discussions about the potential usage of Spoken Word Wikipedia in a GLAM context and how this way of contributing to Wikipedia is another way of engaging stakeholders who might not otherwise contribute to English Wikipedia. There was a session on OGG video that was attended by a Sydney based GLAM person and two photographers who would like to work with GLAMs to take video and pictures related to these organisations for uploading to Commons. Wikimedia Commons has several issues related to video that make contributing video content in OGG format difficult, including size limitations, caching issues, thumb nail creation, and OGG's lower bit rate and inability to stream well. Additional event pictures can be seen on Commons at RecentChangesCamp 2012, Canberra. Our Melbourne meetup coordinator Steven Zhang was pleased with the turn out of Melburnians on Sunday to celebrate Melbourne Wikipedia's 2012 birthday on 15 January. Melbourne's beautiful weather brought together Wikimedians to make one of the best supported meetups held in Melbourne for some time, with 12 in attendance. Participants engaged in lively discussion over tasty pizza and hot coffee. As the meeting progressed we spoke about the 11th anniversary of Wikipedia, and led by our now retired intrepid WMAU public officer and committee member Brian, we charged our cups and glasses in a toast to Wikipedia. In our midst were editors who have been editing for several years; others who are newly acquainted with Wikipedia and who were interested in getting started; others were enthusiastic about getting involved and knowledgeable about the GLAM projects; and others wanting to get involved with Wikimedia Australia with students from one of Melbourne's universities. Several other discussions took place about ongoing Wikimedia Australia GLAM projects and turned to potential future projects as well as offers of help and getting involved. Wanting to sustain the momentum of the meetup, Wikimedia Australia members have already begun following up with participants including those who have some experience with GLAM related projects to ascertain what can be done in the future to support local efforts in Victoria. Steve believes it is important to maintain contact and therefore participants were happy to provide contact details, and agreed to being contacted prior to each monthly meetup. We were fortunate to have on the day among the participants, one person who is a skilled photographer, and who like all passionate photographers goes nowhere without his cameras. He produced terrific individual and grouped photos of participants engaging in conversation around the table, as well as a group photo of all participants, and he countered protestation about him needing to be in the photo by an instructive reply that 'the photographer is always behind the lens'. He is pleased to give his permission to place his photos on Wikimedia Commons. So lots to organise post-meetup. We all look forward to the February meetup and hope that more of our Wikimedian members and community come along and enjoy a great day with all of us; a day that was made possible because of the enthusiastic turn out on Sunday. We take this opportunity to thank everyone for their lively contribution to a successful meetup. On 21 January, a Wikipedia Workshop was held in Melbourne Australia for Southern Sudanese immigrants living in Australia. It was organised by Michael Billington, and six people attended. The group learned the basics of editing Wikipedia by working on Lopit people, taking a stub article up to C class. This workshop is one of several planned for Southern Sudanese people in Melbourne. The workshop will help in Australia's GLAM efforts by giving the workshop facilitator an opportunity to do training that can be used with more traditional GLAM organisations and assist Wikimedia Australia in doing future outreach to minority community cultural organisations in a traditional and non-traditional GLAM sense. WikiProject New Zealand and Stuart Yeates are working through all entries in the Dictionary of New Zealand Biography as part of Wikipedia:WikiProject Missing encyclopedic articles. A very productive interaction via twitter with the Ministry for Culture and Heritage (who manage the dictionary) saw a bug fixed which paved the way for the semi-automated generation of stubs for those listed in the dictionary. Many GLAM projects involve a large-scale upload of media files to Wikimedia Commons. It is thus important to be able to track the reuse of these files. As I am preparing for mass upload of files from Open Access sources, I have been taking a closer look at a subset of the tools that exist to track file usage and that were discussed and worked on at GLAMcamp Amsterdam. Examples are mostly taken from Open Access, which is covered in more detail in the Open Access report. The tool review will continue through February. Table from Tools & Requests. Magnus Manske BaGLAMa tracking, pageviews, categories A tool tracking pageviews of all articles containing images from a specific commons category. A really great resource. Open Access (publishing). See also the dedicated section below. Stats are based on location of images at the time of scanning, which may blur the picture for items that have been featured. Prolineserver GLAMorous tracking, image usage, categories, page views A tool tracking and summarizing the views of all the pages that are using images that are in a Commons category. See Bonnier example for how to use. This is a mashup of GLAMorous and Wikipedia article traffic statistics. Greatly useful mashup (if it works). Examples: category mode (Images from PLoS ONE) and gallery mode (Commons:Open Access File of the Day). "detailed statistics" part often not displayed (example; memory restrictions?). Often, the first entry in the tables has some content in the wrong column (example; one more). Stats are based on present categorization of images, which may blur the picture for past months. Magnus Manske Widget web resource, widget, third party An embeddable Widget for 3rd party websites to display Wikipedia article built on the MediaWiki API. details|example| in use Not sure yet what the intended use case are, but it looks fine in the default example and also worked reasonably well for Open Access Week. Some more examples. The table below gives an overview of the BaGLAMa statistics for commons:Category:Open access (publishing) for November and December 2011, compiled on December 4, 2011, and on January 23, 2012, respectively. Files from that category had thus been in use on over 15000 pages across 140 wikis, gathering on the order of 20 million monthly page hits. While the number of pagehits on pages with OA files decreased from November to December for most wikis (mainly due to the holiday season at the end of the year), the number of pages containing files from OA sources remained equal for most wikis and rose in all others, except in Pashto, where an OA image was removed in a rewrite. Further interesting anomalies are noted in the comments. There are various mechanisms by which featured content is categorized (e.g. featured images, featured articles), but what is the best way to document temporary featuring, such as the appearance on a wiki's Main Page as part of DYK or similar sections? In the following, some manually gathered traffic stats are provided for those Wikipedias that featured File:Paratype of Paedophryne amauensis (LSUMZ 95004).png (originally published in PLoS ONE on January 11) on their main pages at some point during January 2012. The "dates" column gives the approximate period of the image being featured, unless the dates are linked. Tool request: It would be good to have some tools that could construct such a table automatically for any given file or article, i.e. that would track whatever is linked from the main pages of any project, and provide stats and timelines related to that until the link or file are not on the main page any more. What is the best way to document instances of featured content beyond access statistics? Can we automate that in some ways? Open access (publishing) has 505 articles (including subcategories). Here again, timelines would be a great add-on. T. rex infection.png featured as Image of the Week on the Czech Wikipedia during the first week of January (traffic stats). Another version of the file served as Open Access File of the Day on December 27. You can nominate a file. 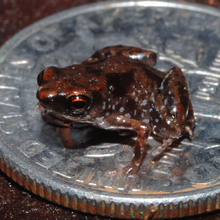 The frog Paedophryne amauensis on a US dime. The image was featured on the Main Page of at least the Thai, Bulgarian, English, German, French, Chinese, Norwegian, Finnish and Russian Wikipedias in January (see gallery) and served as Open Access File of the Day on January 12, the day after the open-access article with the taxonomic description of the species had been published. The associated wiki articles about the species have been featured - or are scheduled to be so - on several other wikis, including the Spanish, West Flemish, Portuguese, Simple and Polish Wikipedias. It now exists in over 20 languages (see cross-wiki access stats). While being featured, it also drove considerable traffic to articles about the journal in which the original image was published (PLoS ONE) as well as its publisher (PLoS). A PDF copy of the article en:Research Works Act served as Open Access File of the Day on January 18 during the SOPA blackout. The article had been featured in the Did you know section of the English Wikipedia on January 15 (access stats for Research Works Act, United States House of Representatives and Open access mandate). The Wikimedian in Residence on Open Science project does not fit well into the Germany report, so this Open Access report will serve to highlight activities in this area throughout the month. used on at least two wiki pages outside user namespace, either on Wikimedia projects or on sites using InstantCommons, from the day of nomination until the day of posting. By the end of January, WikiProject Open Access had five members. In September, the open-access journal PLoS Computational Biology expressed an interest in publishing review articles suitable for being posted to the English Wikipedia as a seed for an evolving overview article on the subject (Signpost coverage). This kind of reuse of Open Access materials on Wikimedia projects - made possible by the journal using a Creative Commons Attribution license - goes beyond some existing partnerships with scientific journals, e.g. that with RNA Biology, which requires authors of manuscripts on new RNA families to accompany their submissions with the draft for a Wikipedia article (Wikinews coverage). By now, PLoS Computational Biology has established a dedicated manuscript track - Topic Pages - and the first manuscript has passed peer review and entered production. The initiative was well received at the Academic Publishing in Europe conference, one of the key conferences on scholarly publishing worldwide, where the Wikimedian in Residence on Open Science gave a plenary talk. Materials from Open Access sources or otherwise related to Open Access have been featured on several Wikipedias this month. The following examples have been gathered manually, but it would be nice to have some automated support for that. Technical aspects of the documentation of such feature events are also the subject of a dedicated section in the tool testing report. In November, the White House's OSTP had issued a Request for Information on matters of Open Access, and a response has been submitted on January 12 on behalf of RCOM. It was officially received as response 298 of 375. The results of a similar consultation by the European Commission, to which a WMF response had been submitted in September, have also been published in January. A number of tools for the documentation of Open Access-related activities have been tested - see the Tool testing report. Work on the Open Access Media Importer, a tool to automatically upload multimedia files from Open Access sources, has started, supported by Wikimedia Germany's Wissenswert initative. This page was last edited on 9 October 2017, at 19:25.